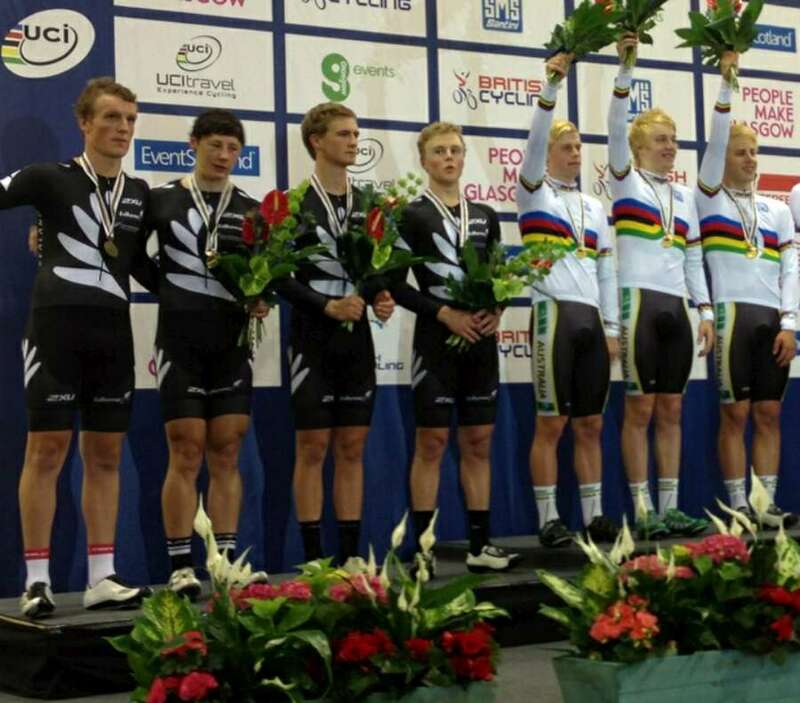 New Zealand, featuring Southland riders Josh Haggerty and Liam Aitcheson, has won a silver medal on the opening day of the UCI Juniors Track Cycling World Championships in Scotland today. The BikeNZ quartet of Liam Aitcheson (Alexandra), Regan Gough (Central Hawkes Bay), Josh Haggerty (Invercargill) and Connor Stead (Christchurch) won the silver medal in the final of the team pursuit at the Sir Chris Hoy Velodrome in Glasgow. It is the third straight year that New Zealand has won a medal in the men’s 4000m team pursuit and their sixth podium in the discipline in 20 years at the world championships. They produced an excellent 4:12.298 effort in qualifying behind defending champions Australia who were the class of the field, going on to win gold in the final ride with a powerful performance. New Zealand edged out Russia and Great Britain by a close margin in qualifying to earn the gold medal ride-off against Australia. “We really put everything we had into that qualifying ride,” said Aitcheson. “Regan (Gough) especially put in so much and we were all pretty tired tonight. But we warmed up well and gave it everything tonight. Russia took out the bronze, on the back of a sub-minute opening 1000m in the ride-off and were three seconds faster than the Kiwis. Aitcheson said the team was well prepared. The Alexandra rider said the experience in the new $150m Sir Chris Hoy Velodrome was remarkable. The team had been impressed with the speed of the track after coming from their training track in Ghent although it proved heavier in today’s competition. Earlier the men’s team sprint trio of Quinn Karwowski, Callam Saunders (both Blenheim) and Jeremy Presbury (Invercargill) were beaten into fourth place in their bronze medal ride off against Germany. They qualified fourth fastest in 46.419s, with 18/100th of a second separating the top three teams – Australia, Russia and Germany. Australia went on to win the gold medal over Russia but Germany’s 45.581s effort to beat New Zealand for the bronze medal was the fastest of all teams today. Tomorrow Stead and Alex Hooper (Ashburton) compete in the individual pursuit, Presbury and Saunders race in the keirin and Haggerty in the scratch race. Men 4000m team pursuit, final: Australia 4:06.182, 1; New Zealand (Liam Aitcheson, Regan Gough, Josh Haggerty, Connor Stead) 4:12.298, 2. Bronze medal ride: Russia 4:09.755, 3, Great Britain 4:13.371, 4. Qualifying: Australia 4:09.364, 1; New Zealand 4:12.056, 2; Russia 4:13.065, 3; Great Britain 4:13.824, 4; Switzerland 4:17.709, 5; Colombia 4:17.815, 6; France 4:18.255, 7; Italy 4:19.201, 8; Denmark 4:19.689, 9; Argentina 4:20.447, 10. Men Team Sprint final: Australia 45.639, 1; Russia 45.714. Bronze medal ride-off: Germany 45.581, 3; New Zealand (Quinn Karwowski, Jeremy Presbury, Callum Saunders) 46.363, 4. Qualifying: Australia 45.800, 1; Russian 45.978, 2; Germany 45.980, 3; New Zealand 46.419, 4. CAPTION: The New Zealand team pursuit combination on the podium in Glasgow.